Notes from Former FBI Head James Comey related to his discussions with President Trump were finally released by the DOJ and FBI last night. These damning notes follow the release of the DOJ’s IG report less than a week ago that provided evidence that former FBI Head Andrew McCabe lied multiple times, including under oath. The McCabe report exposed President Obama’s FBI and DOJ as corrupt, dishonest, coordinated and conspiring. Comey’s notes provide additional support of a very dishonest, conniving and corrupt FBI led by Comey, who set the tone. Less than a week since the DOJ IG’s report about fired former FBI Head Andrew McCabe, the DOJ and FBI finally released James Comey’s notes as requested by Congress. These notes show a very corrupt, manipulative, conniving and dishonest FBI Director. 1.First note that the notes were classified and therefore Comey leaked classified information. 5.The President immediately said this was false but Comey never released this information. 9. On page 3 begins corrupt Comey’s 2nd meeting notes with President on January 28, 2017 [shortly after the inauguration]. 13. Comey said AG Lynch directed him not to use the word “investigation” [in the Hillary matter]. 15. President Trump next asked about McCabe and whether he as a problem with the President and Comey said “he’s a true professional [L] and had no problem at all” [L – it was well known in the FBI that McCabe hated Trump]. 16. Comey next bashed former Republican AG’s but not Obama’s AG’s Holder or Lynch. 17. President Trump again said the dossier Comey presented to him in the previous meeting was not accurate. Trump noted that he didn’t even stay the night in Russia during the Miss Universe contest when some incidents were said to take place. 24. On page 8, Comey tell Priebus their conversation was private [L]. 25. Priebus asked whether there was a FISA application on General Flynn and Comey answered but it is redacted. 29. On page 10 Comey begins his notes from a February 14, 2017, meeting with the President [Valentine’s Day]. President Trump says that he thought his phone was protected but that the calls he made with Australia and Mexico and that General Flynn’s call with the Russians were taped and then leaked. Comey says he tried to interject several times that “leaks are terrible” but the President wouldn’t let him. 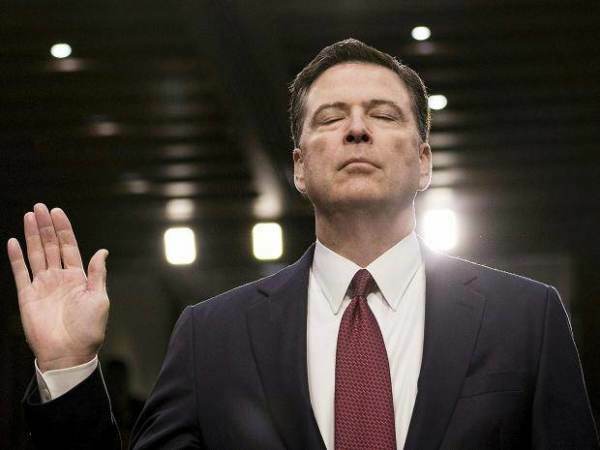 [L – Comey is a leaker] Comey says it’s terrible his calls were leaked. [L – Comey is a leaker] Comey says FBI leaks were terrible [L – Comey is a leaker]. 32. On page 12 Comey notes a very brief call from the President and then on page 13 he notes from his discussion with the President on March 30, 2017 via a phone. The President stated that the Russia business was hurting him and that he was going to personally sue Christopher Steele. 33. President Trump asked what Comey could do to lift the cloud. Comey replies that they were “running it down as quickly as possible’ [L – this mess is still going on and the cause of the corrupt Mueller investigation]. 1. The notes were classified and Comey leaked them which is a crime. 1. Comey writes that his “plan” in how he wanted to share the fake dossier with President Trump went exactly the way he wanted. This indicates Comey was conniving and manipulative in presenting the fake dossier to the President. 3. At least three times Comey tells the President he is not under investigation which is probably a lie but no matter how many times the President asks the FBI Director to share this with the American people, he refuses to do so. 4. Comey lies over 40 times in the 15 pages of notes. Some of his lies are known at this point from other information [L] and some probable lies [PL] are based on other information and a track record of lying from Comey. In total we identified 17 probable lies [PL] and 25 outright lies [L]. 5. The Weiner emails are again noted in these notes as they were noted in the McCabe IG Report. These may include information that Comey and others do not want released to American voters and this may be why they are going all out to remove President Trump. 6. The Corrupt individuals in the government have no concern for the American people or the President they elected. Comey shows in these notes that he is dishonest, manipulative, conniving, conceited, arrogant and corrupt. Fired former FBI Director James Comey is a leaker and a liar!